Green also appeared on the program “Democracy Now” on Wednesday. 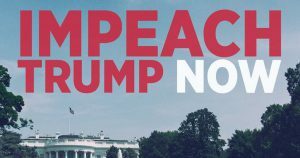 Solomon is the national coordinator of RootsAction.org, the online group that is co-sponsoring (with Free Speech For People) the Impeach Donald Trump Now petition campaign that currently has more than 1.1 million signers. Solomon is the author of War Made Easy: How Presidents and Pundits Keep Spinning Us to Death. He is executive director of the Institute for Public Accuracy.